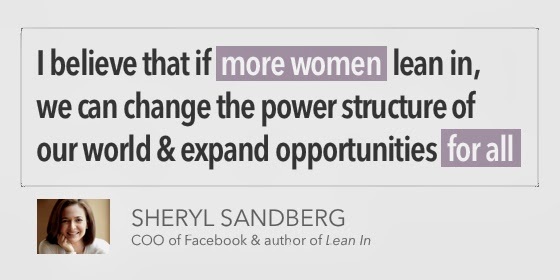 I have to confess that the first time I ever heard of Sheryl Sandberg was when she was interviewed on 60 Minutes about her book, Lean In: Women, Work and the Will to Lead. I had missed her, apparently, wildly popular TED Talk that introduced her to some 2 million viewers sharing essentially the same message of upbeat, non-confrontational, message about women’s equality. 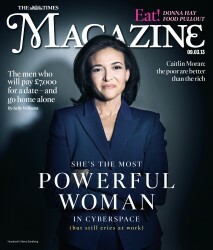 Now, I can’t seem to get away from hearing about Sandberg, the powerful Chief Operating Officer for Facebook. Given that my 2nd grade report card from Mrs. Battle at Meadowbrook Elementary School noted that I was a “good student, but wants to run the class,” I was taken in a little by Sandberg’s desire that “every little girl who gets called bossy” should be viewed as having “leadership potential.” But, as I’ve learned more I’ve come to realize that Sandberg’s notion of “leaning in” highlights the trouble with white women and white feminism that I’ve been detailing in this series. For those of you following along with a bingo card of feminist theory, you can fill in all the squares marked “liberal feminism.” For Sandberg, the root cause of inequality rests at the individual level of the choices women make, and to a lesser extent, society’s beliefs about women (which they then internalize). Within Sandberg’s conceptualization, there’s nothing wrong with the way society is set up, women just need to shake off those bad messages about being “bossy,” sharpen their elbows and claim their space at the corporate table. Liberal feminism is an individualistic version of feminism, the same kind of feminism articulated by Susan B. Anthony and by Betty Friedan. The goal of liberal feminism is for women to attain the same levels of representation, compensation and power in the public sphere as men. In order for change to happen, liberal feminists rely primarily on women’s ability to achieve equality through their own individual actions and choices. The praxis – the actual work involved – becomes the “motivational work” women must do on themselves to fit into the male-dominated corporate structure. So, what’s the trouble with this and how does race matter here? To women of color young and old, along with anti-racist white women, it is more than obvious that without a call to challenge and change racism as an integral part of class mobility she is really investing in top level success for highly educated women from privileged classes. The call for gender equality in corporate America is undermined by the practice of exclusivity, and usurped by the heteronormative white supremacist bonding of marriage between white women and men. Founded on the principles of white supremacy and structured to maintain it, the rites of passage in the corporate world mirror this aspect of our nation. Let it be stated again and again that race, and more importantly white supremacy, is a taboo subject in the world according to Sandberg. Whenever I mention this appearance of liberal feminist views to a room full of feminist scholars, as I did recently, the usual reaction I get is “well, now that’s weird.” As if, it’s odd that liberal feminism and white supremacy could co-exist in this way. But, it’s not odd at all. This is not a case of politics makes strange bedfellows. It is, in fact, perfectly logical that liberal feminism and white supremacy should be intertwined in this way if white supremacy allows for some gender equality while liberal feminism still has no critique of race or racism. It’s part of why my father, an avowed white supremacist in many ways (he moved our family 4 hours north to avoid a school desegregation order), could raise me with a fairly gender-egalitarian set of expectations. His hold on white supremacist beliefs was not inconsistent with his mostly progressive ideas about raising a girlchild without limitations. 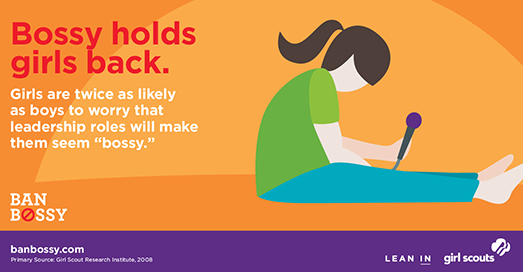 So, what is holding girls’ back? 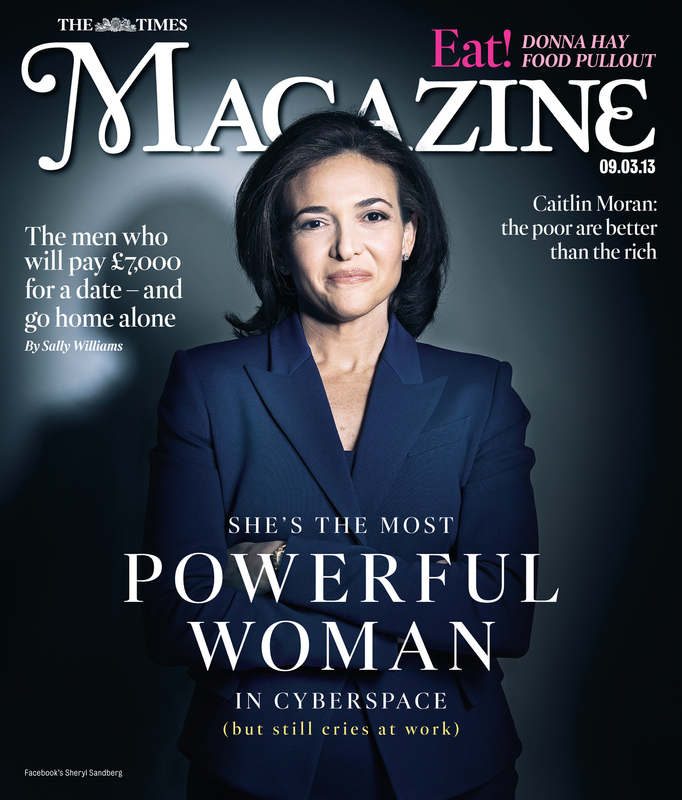 According to Sandberg, it’s being called “bossy” and internalizing that message. She has now launched a spin-off campaign, in partnership with the Girl Scouts, called “Ban Bossy”. In the illustration above it cites one of the cornerstone facts that the campaign is based on, that is, “girls are twice as likely as boys to worry that leadership roles will make them ‘bossy'” – a factoid drawn from a small subsample of a 2008 report by the Girl Scout Research Institute, “Change It Up!” The subsample of 360 children who said they weren’t interested in being leaders, and who were asked about the reasons for this disinterest. “I do not want to seem bossy” was mentioned by 29% of the girls but only 13% of the boys, so that does back up the fact in the illustration. There’s more to the story, however. In the larger survey pool, girls were just as likely as boys to say that they wanted to be leaders and to agree that “I think of myself as a leader.” They were also equally likely to describe themselves as “confident,” “talented,” and “strong.” Moreover, the girls in the survey were more likely than boys to report actual leadership experience. Thus, 31% of girls compared to 26% of boys said they had been the leader of a team for a school project; 13% of girls but 10% of boys had run for a class or school office. This is consistent with a vast amount of recent data showing that girls are outpacing boys on all sorts of academic and social measures. Sandberg (and her organization) are also doing something very clever with the marketing campaign for “Ban Bossy” that disguises the way liberal feminism is consistent with white supremacy. 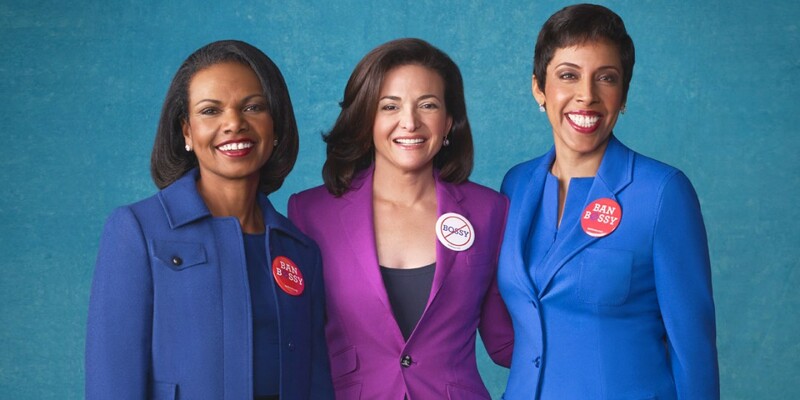 Sandberg’s “Ban Bossy” campaign seems to be catching on in some quarters, but I’m also hearing lots of people (often women of color) say they are conflicted about this latest move. For her part, bell hooks suggests reclaiming bossy and proposes a counter move: #proudandbossy. From my point of view, the conflict is about the fact that for so many of us the “bossy” label resonates with something of s sting, yet, many of us also know, at least at some level, that the solution being offered us here is inadequate, even suspect. Simply put, in Sandberg’s corporate-themed, liberal feminism there is no apparatus – either theoretically or in praxis – for dealing with race or racism. And that is the trouble with white women for this week. I’ll be back next Tuesday and take a look at white women in popular culture.